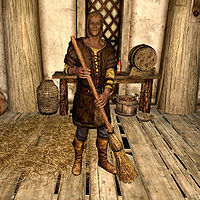 Eimar is a Nord warrior who works at the Honningbrew Meadery. He wakes at 6am for a one-hour breakfast, then starts his workday. During work, he can usually be found sitting at the bar, drinking, or cleaning the place. He takes a break at noon to eat for one hour. His workday ends at 8pm, when he has a four-hour dinner before going to bed at midnight. Eimar wears farm clothes with a pair of boots. He wields a steel dagger in combat. Eimar will greet you with either "If you need to sample some of the finest mead in Skyrim, you're in the right place. ", "If you're looking to purchase any mead, speak to the owner, Sabjorn. ", "We're a small meadery, but growing quickly. Sabjorn's only been running this place for a short time now and look at it. ", or "Mallus is teaching me everything he knows about brewing. Hopefully, I can take over his position some day." This page was last modified on 22 January 2014, at 14:19.